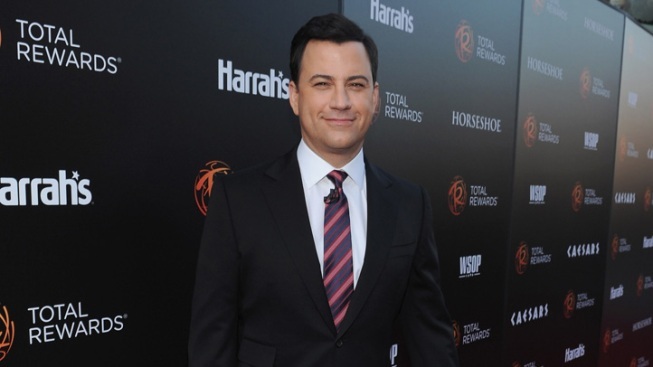 Late night host Jimmy Kimmel, pictured here attending an event in Hollywood, poked fun at House Speaker John Boehner's emotional tendencies in a commercial spoof for a crying doll called the "Boehner Baby." House Speaker John Boehner isn’t one to shy away from expressing his feelings, and on Thursday night Jimmy Kimmel poked fun at Boehner’s propensity for shedding tears with a commercial spoof of the "Leaker of the House." "John Boehner cries a lot," Kimmel said in his opening monologue, before throwing to a collection of clips showing the House Speaker shedding a few tears. "Here he is crying at a college commencement speech… This is just after the latest episode of ‘Desperate Housewives,’" Kimmel joked. Kimmel’s jibe comes a few days after Boehner teared up at a Congressional Gold Medal ceremony that posthumously honored Italian artist Constantino Brumidi, who came to the United States in the 1850s and was commissioned to paint portions of the Capitol. But despite his mocking, Kimmel insists he appreciates Boehner’s emotional tendencies. “I think it shows his sensitive side you don’t usually see in a politician. And he’s even created a new toy sensation among little girls," Kimmel said before throwing to a commercial of the “toy sensation,” which was accompanied by a catchy "Everything makes him cry" jingle. Described as “the soft, sensitive baby doll that cries real tears,” the Boehner Baby is shown crying at a tea party after spilling his cup of tea.